Some wizard somewhere looks at what our heroes are doing and resurrects Venus for whatever plan he has. It doesn’t matter because this is the last issue. Elisa manages to take down the real killer, and that’s not satisfactory for the guy she falsely arrested. His life will never be the same and he’s more than willing to stay mad about it. Elisa considers quitting the force but her chief will have none of it and Goliath consoles her later. 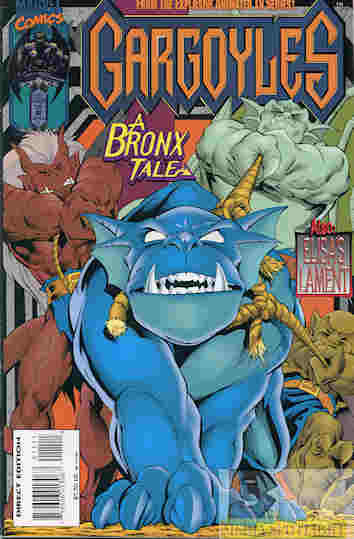 Meanwhile the trio search for Bronx who ends up in the Bronx and befriends a child with some jerk friends. He and the trio end up saving them when one of the kids starts a fire in an abandoned building trying to set off fireworks. Everyone returns to the clock tower just before dawn. What they got right: All of the stories wrap up satisfactory. While I personally would rather see Elisa forgiven due to personal preference it does make sense that the man may not be willing to forgive her, meaning she still has to learn to forgive herself. I can appreciate that and it’s done well. The Bronx tale isn’t too bad. What they got wrong: Apparently nobody told the creators that this was the last issue as they’re setting up the next one as if it was going to happen. Venus would have been brought back and I wouldn’t care because I didn’t care about her to begin with, and while I’m not against the comic coming up with their own villain he doesn’t appear all that interesting to me. Recommendation: Overall this series just wasn’t that great. At best it was okay but only two issues had a story I was interested in and I might want to check out the issue I’m missing that featured the Pack because they were my favorite threat from the show. Otherwise I’m not sure I can recommend this and maybe less so to the fans, although I don’t know what the fanbase’s general reception to the series is. Next week I’ll be moving on to the Slave Labor Graphics books that Greg Weisman actually worked on and are considered canon. We’ll see how that turns out. Posted by ShadowWing Tronix on March 21, 2018 in Animation Spotlight, Television Spotlight, Yesterday's Comics and tagged Bronx (Gargoyles), Elisa Maza, Gargoyles, John Costanza, Marvel Comics.